ATLANTA (September 7, 2016) – A team of Georgia Aquarium researchers returned to the waters off the coast of Marineland, Fla., earlier this spring to study manta rays, along with partners from the Marine Megafauna Foundation. This was the fifth year researchers have studied manta rays in northeast Florida. The rays are typically found in warm tropical waters. The coastline of Florida has been proven to be an ideal location to study them, particularly as they begin to move north along the coast as the water temperature begins to increase in the springtime. This year the researchers spent two weeks performing aerial surveys, collecting tissue samples, and attaching satellite tags. Tissue samples were collected to study the genetics of the manta rays and look for similarities and differences with other manta ray populations. A team of researchers, led by Dr. Andrea Marshall, founder and executive director of the Marine Megafauna Foundation, who believe a third species of manta rays live off the coast of Florida. Genetics testing using the collected tissue samples will help prove or disprove the theory. Satellite tracking tags were attached to six manta rays in order to collect data on migratory patterns and behavioral habits. Manta rays are migratory animals. Therefore, researchers are hoping to better understand if manta rays are remaining in northern Florida or migrating further up the coast. Both known species of manta rays, the Reef Manta Ray and the Giant Manta Ray, are listed as “Vulnerable” on the IUCN Red List. In some countries, manta rays are harvested for their meat, skin, liver, and for traditional medicinal purposes. Manta rays also face potential injury from boats and fishing nets. Georgia Aquarium hopes to partner with locals to identify and establish best practices on how to not disturb or injure manta rays when fishing and boating in the area. Georgia Aquarium is the only aquarium in the United States that has manta rays in their care. 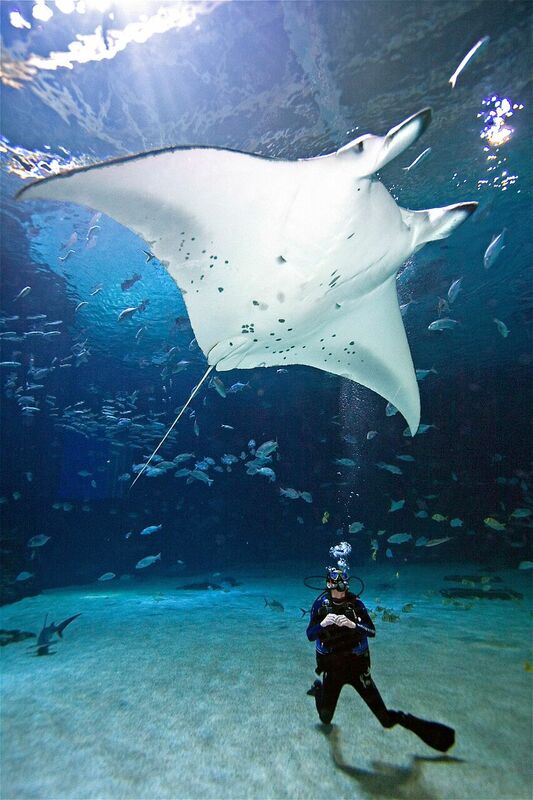 In 2008, Georgia Aquarium provided a permanent home for a Reef Manta Ray named Nandi who was rescued and rehabilitated off the coast of South Africa after becoming entangled in a shark net. In addition to Nandi, there are three other mantas are in the Aquarium’s 6.3 million gallon Ocean Voyager Built by The Home Depot exhibit alongside four whale sharks and thousands of marine life. These manta rays are a guest favorite and serve as ambassadors to help the public better understand and appreciate these extraordinary animals. Little is known about manta rays and their migratory patterns, which makes manta ray research important. Georgia Aquarium hopes to continue research efforts in the upcoming years to understand more about this graceful giant. For more information on research and conservation efforts, please visit www.georgiaaquarium.org/manta-rays. Manta rays can be found in warm temperate and tropical waters of the Western Atlantic throughout the Western Caribbean. Manta rays are divided into two species, the Reef Manta and the Giant Manta. Mantas are listed as “Vulnerable” on the IUCN Red List. They are primarily plankton feeders, but also consume small fish. The two cephalic lobes located on either side of the mouth unroll and angle downward to create a funnel guiding prey into its mouth. Manta rays can be seen in Georgia Aquarium’s Ocean Voyager Built by The Home Depot. All research activities took place in accordance with the Florida Fish and Wildlife Conservation Commission Special Activity License Program.